It's a late Tuesday night, well or maybe, an early Tuesday morning. Being it's passed 3am after all. Yet the time of day did not phase Violetta at all. For she is a being of the night, a vampire. A newly made vampire is what she felt like at the moment. With a huge smile on her face she can be seen taking a stroll through the night, with fog dancing about the streets in town. She wanted to clear her head and try revive herself back to earth, after that fascinating alone time with....does she dare say it...mate? Violetta feels so foreign saying the word, for she never took on a mate before. A lover perhaps he can be called? No? Yes, lover is correct. Violetta has now gained herself her first lover. Apparently had her first time with him too. "I am so happy I'm no human, other wise my body probably wouldn't have survived that. No I'm positive I wouldn't. Especially with Blackfang clutching my skin so tight in all the random places." Subconsciously her hands rubs over her body, remerging every inch of her he has touched. He has claimed. "What the hell am I doing, I'm perfectly fine. He's fine..i think." Tapping her chin in mid-thought. ' Maybe we should talk after we come back..we kinda just went with it, yet it felt right.' "Yeah i'll just talk to him when I return home. Maybe he will still be there when I return. Or he's probably on his way back to...Romania.." Shaking her head from the thought, she'll be fine wither way. They can talk through their minds after all. The reason why she's outside so late is she waned to get her hair done. A new color maybe? Darker brown. Yes, dying her hair Is a nice change. Maybe Blackfang himself will like it. Who knows. After contacting her human hairdresser telling her to be there when she took a detour through a park. Since humans are much slower then vampires, she will give her time to prepare for Violetta. 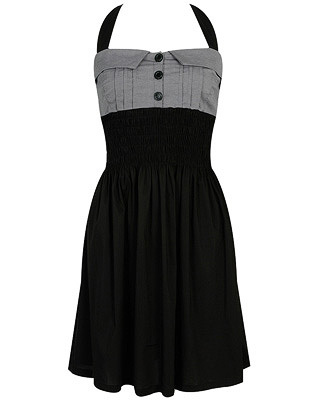 Her choice of dress is this lovely decent, spring time, Black & gray Dress. It feels nice around Violetta's frame, and she thought it would look even better with her new hair style. Thinking about her hair made her think about few hours ago. When her body was tangled along with Blackfangs in her tub all wet. Her lips just couldn't help but curl up in pure delight. Violetta was beginning to like this man even more. Since he did imprint on her, seems wolves imprinting is the most absolute form of action when it comes to love itself. All of those emotions of hers just made her want to sing. So her mouth opened and she began to sing. Love Me Like You Do by:Ellie Goulding while waiting for her hair appointment.